The American Legion maintains an important presence in North Carolina, a state that is home to several large military bases and thousands of active and retired soldiers. The U.S. Congress officially granted a national charter for the American Legion on 16 Sept. 1919, although the organization had already begun operations before that time. The first national convention was held in Minneapolis, Minn., later that year. Since then, the American Legion has pushed for increased and improved care for disabled and sick veterans and was a major force in the establishment of government-funded hospitals to care for veterans. The legion also played a role in the creation of the Veterans Administration in 1930, of the Department of Veterans Affairs in 1989, and in the passing of the original GI Bill of Rights for veterans of World War II and subsequent wars. North Carolina's first American Legion Post was established in Raleigh on 20 July 1919 and was designated Raleigh Post, No. 1. Thereafter, there was a proliferation of posts in North Carolina. The first North Carolina American Legion state convention was held in Raleigh on 20 Oct. 1919. The first women's auxiliary post was chartered in Winston-Salem in 1920, and others quickly followed. In keeping with period social codes, posts for African American legionnaires were originally formed separately from ones for white legionnaires. The first post for blacks in North Carolina was Post No. 4 in Wilmington, and Post No. 124 in Pembroke in Robeson County was composed of Native Americans. By 1929 North Carolina had 101 active white posts and 16 black posts. Total membership in 1929 was 12,001, with 682 of these being African American members. Henry L. Stevens Jr., from Post 109 in Warsaw, served as the American Legion national commander in 1931-32. A fiftieth-anniversary convention for the North Carolina American Legion was held in Winston-Salem in June 1969, with Governor Robert W. Scott as one of the principal speakers. That year approximately 25,000 of the 40,000 members in North Carolina attended the convention. An evening banquet and dance was held at the Robert E. Lee Hotel in Winston-Salem. The American Legion in North Carolina is currently divided into five divisions, with each of these subdivided into five districts. By the early 2000s there were approximately 40,000 legionnaires in 200 posts across North Carolina. Ray G. Smith from Post 109 in Benson was elected national commander for the years 2000-01. Many prominent North Carolinians, such as Governor R. Gregg Cherry, Governor Luther H. Hodges, Senator Samuel J. Ervin Jr., State Treasurer Edwin M. Gill, U.S. Representative Lawrence H. Fountain, and others, have been proud members of the American Legion. A. L. Fletcher, History of the American Legion and American Legion Auxiliary: Department of North Carolina, 1919-1929 (1930). Wendy Hower, "Doug Tyson's Duty," Raleigh News and Observer (28 May 2000). Thomas A. Rumer, The American Legion: An Official History, 1919-1989 (1990). 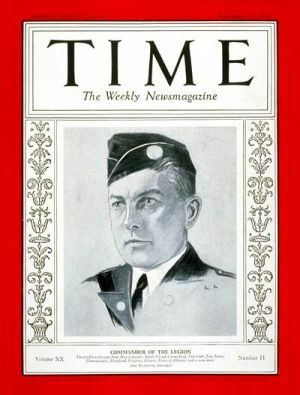 Henry Stevens, Jr. American Legion Commander 1931-32. Image courtesy of the NC Office of Archives & History. Available from http://www.ncmarkers.com/Markers.aspx?MarkerId=F-63 (accessed September 21, 2012). On June 15, 2013, Department of North Carolina American Legion, after 95 years elected the state's first Woman and first African American State Commander. She became the second African American woman State Commander nationally in the American Legion history so far. Her name is Patricia A Harris from Apex Post 124. Patricia is the 98th Department Commander in North Carolina and she's from Raleigh. Thank you for taking the time to share this history with us. Your contribution will stay with this American Legion entry so that future readers will see this additional information. We are always grateful when our visitors take the time the time to contribute their knowledge to our publications.